Convection n. -- a highly sought-after airflow cooking method that uses fans to circulate hot air inside an oven. This speeds up cooking time and evens out the irregularities in cooked consistency. And now, this same convection oven technology can be found in a portable bread maker. Sounds awesome, right? The Cuisinart Convection Bread Maker utilitzes this convection cooking method in a programmable, automatic machine -- and there are hundreds of possible bread combinations to choose from as far as programmability goes. It comes with 16 different settings for low carb, gluten free, artisan and sweet breads, or just kneading dough. The darkness of the crust is adjustable, and the large pan can accomodate three different loaf sizes. Also, in case the dough's already pre-made, the Cuisinart also has a "bake only" function. Technically speaking, the convection system is of excellent quality and seems to work as well as advertised. 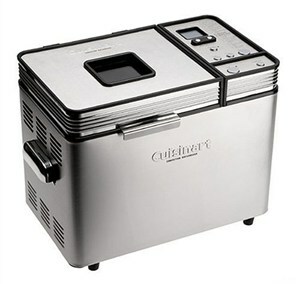 Another feat of engineering in this Cuisinart bread machine is a "power save" function. This is a crucial feature to have if you live in an area with frequent power outages, no matter how short the power failure may be. If at any point you lose electric power, the Cuisinart Bread Maker will remember where it left off during the baking cycle when the power comes back on again; it won't reset from the beginning. For all its feats, however, the Cuisinart isn't perfect. The most frequent complaint is due to the baking pan, which can pop out midway through the baking cycle. This manufacturer's flaw is easily fixed, though -- a quick solution is to pull out the metal tabs where the pan rests until it's a tighter fit. Also, don't assume that the recipes you use in another manufacturer's bread machine will work identically with this one. Start with the recipes that come with it, or are recommended for it online, and go from there. For example, low carb breads with extremely low carbohydrate count might not bake as evenly as other breads that are on the "higher carb" end of the special diet. The Cuisinart may not be perfect for all, but its vast programmability and excellent convection cooking ability are definitely worth consideration. It's housed in a brushed stainless steel exterior with stay-cool handles and is paired with a manufacturer's 3-year limited warranty.